In late 2017, Washoe County Nevada issued a call for proposals for an exterior public art installation, commissioned through support from the National Endowment for the Arts and the County’s Community Special Projects program. 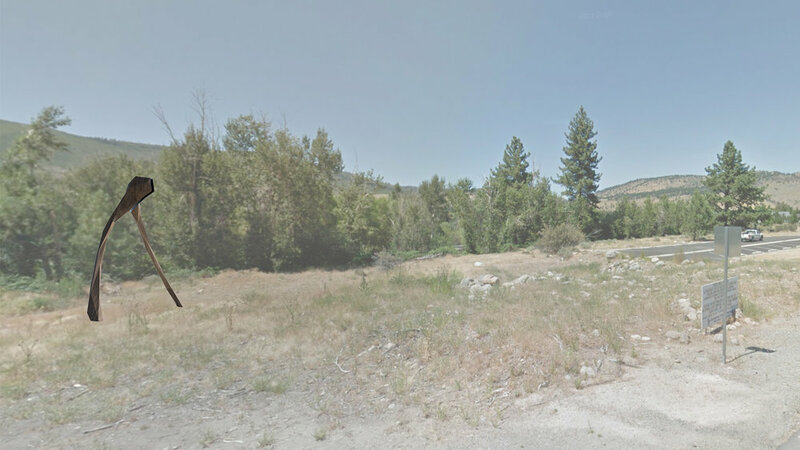 The request was for 2 sculptures installed in 2019 to act as trailhead markers on both sides of a 200 mile trail that winds along the Truckee River, passing through Reno Nevada and the Pyramid Lake tribal lands to its terminus in Gerlach, Nevada. Below is a summary of 2 proposals I submitted in December of 2017. The first concept I am proposed is a gateway that outlines the walking path and serves as a definitive point of “entrance” to the trailhead. From the road or parking lot, the first thing people may notice is what appears to be a large wishbone lying on its side. As visitors walk toward the trail entrance, they notice that this wishbone is split in perfectly in half, forming a gateway with each piece on either side of the trailhead. Functionally, the shape would guide people through the ‘funnel’ onto the correct path, which is especially useful when winter snow covers the route. It would also provide a distinct landmark and place to sit while your hiking party gathers. Conceptually, this wishbone is special in that it is split perfectly in half. However unlike the ancient tradition of breaking the wishbone to grant one person their wish, this wishbone grants both wishes. The shape formed by a single half is also reminiscent of a ‘Ruyi’, a Chinese Buddhist talisman symbolizing good fortune that literally translates: "as desired; as [you] wish”. A smaller vertical archway with a ‘magic’ split view of the sky. This sculpture allows for variable scale; a taller one could span the trail itself or a smaller version could stand alongside the trail as a marker. The inside flat faces would be faced with mirror-polished stainless steel to reflect the sky and surroundings. Looking upward, the viewer sees a sliver of the sky separating the halves. The legs would be anchored to concrete footings. The split should be around 2.5m (8ft) high so people can easily pass under it and look up at the sky but also for safety as there is no easy way to get a hand grip for climbing. I would prefer to not have anything in between the split, but would investigate various engineering options if connecting the halves is required for strength. The model used in these renderings was simplified to weld a small steel ‘proof of concept’ sculpture. Lately I have been working in CorTen steel, teak, and aluminum but would like to get some input from the local community on the final aesthetic. Using wood would provide a physically warm and mechanically soft surface for people to sit on and even carve their initials, which I wholeheartedly welcome. To get the community involved or to raise additional funds, we could more permanently etch sponsors’ names or quotes into the facets. Another idea is to provide sidewalk chalk and encourage people to use it as a temporary message board which washes clean every time it rains. The sideways orientation is balanced and stable but would still require concrete footings and potentially a vertical support to stiffen the long cantilevered ‘arms’.